One of our favourite indulgences here in Andalusia is the food! Our friend Molly also loves to try new dishes as she carries out research for her blog, but sometimes when visiting a new place you just need someone to point out what’s good. Not an easy task when Andalucia is such a large region of Spain, and the culinary choices are vast. So Molly has kindly picked out some of the more typical (and delicious) dishes of Andalucia that you can try when you visit Southern Spain. Migas means crumbs. This filling dish is made from breadcrumbs or from flour depending on the recipe. They may be served with sardines, green peppers, roast onion and even melon across most of Andalucia. This is served as a main course or it may be offered to you as a tapa on a small plate in a local bar. 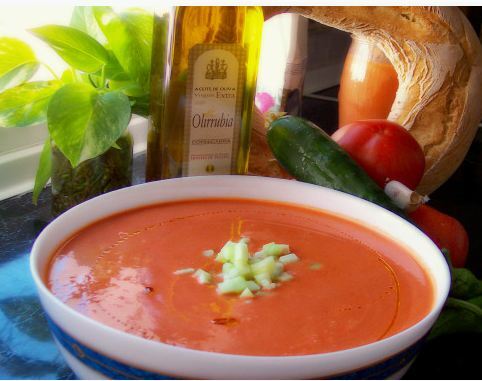 Cordoba is famous for its Salmorejo. This thick tomato soup is served cold with Spanish ham and egg in hot summer months. Gazpacho is a similar dish; this is served without breadcrumbs in the recipe so it is more fluid and not as thick. Porra from Antequera is very similar to Salmorejo and can be found in the Inland Malaga region. Piononos of Santa Fé. These golden cakes from Granada are bursting with flavor. They are made from sugar, egg and cinnamon. The piononos of Santa Fe are named after a village next to Granada´s airport. The Pionono name comes from were named after the Pope Pius IX which is Pio Nono in Italian. 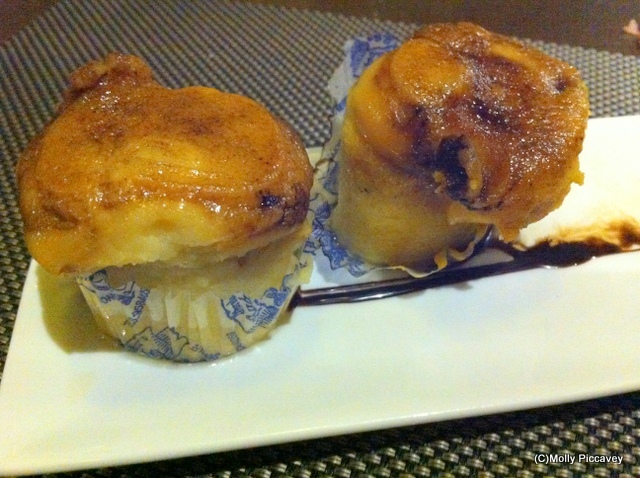 They are sold in cake shops and some restaurants throughout the city of Granada. Rute in Cordoba province has its own variety of Pionono too. 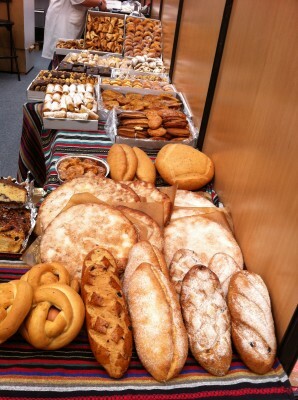 Chunky village bread, pastries and cakes. Andalucia has a huge variety of little cakes, pastries, chunky rustic breads and a whole assortment of biscuits and sponge cakes. Each village or area will have it´s own recipes and traditions. Throughout the year the customs change depending on the seasonality of ingredients. Especially at Easter and Christmastime there many things available only at the time of the year. When you are in Andalucia head into a bakery or cake shop and see what they have on offer. A great Spanish comfort food is Chocolate con churros. In Andalucia it´s common to see locals enjoying them for breakfast. Although it is also served for an afternoon treat too. The chocolate is really thick and not too sweet. 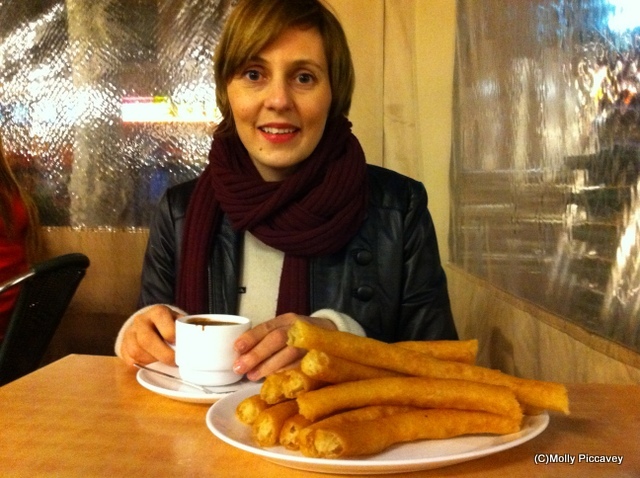 Churros are great on a cold rainy day or on a wintry afternoon. They are quite filling and don´t appeal as much on a scorching hot day.